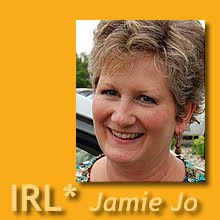 IRL*in real life with Jamie Jo: Why Me? Is there any missionary who hasn't asked this question? Most often, I’m afraid I grumble “Why me?” out of frustration, like those days when everything goes wrong. Days when the kids are throwing up from both ends, days when the cistern runs dry, the electricity glitches, and dinner burns. Days like my favorite children’s book, Alexander and the Terrible, Horrible, No Good, Very Bad Day. On better days, though, I ask with a heart of gratitude, humility, and wonder: “Why me?” Of all the spiritually qualified and talented women out there, why am I so blessed to live out this life of service to God? A casual glance at Scripture shows that God delights in using "cracked pots" to accomplish His will. He chose me on purpose. Why? So people will recognize that God is the true source of any good I can possibly do. That’s me, too. I’m anybody and everybody. Although I have been on the field a bit longer than some of you, I do not pretend to have experienced as much as you have. I have learned a lot, but I am an expert at nothing. Although I am older than many of you (egads, I’m almost 50! ), I would be foolish to imply that I am more mature or even one step ahead of you in your walk with Jesus. My idea is to come alongside you, bring in some humor, and help us laugh at ourselves as we live out these impossible stories God has written for us. I will strive to always be very transparent, authentic, candid, open, and real. I don’t ever want to be a fake. According to thesaurus.reference.com, “A fake is a work of art that is deliberately made or altered to appear better, older, or other than what it is.” Yikes! No thanks. If anything, I would rather be genuine and appear younger. People who know me IRL (in real life) should be able to laugh and say, “Yes, that’s true!” No pretense. No image to protect. Simply me, walking hand in hand with you, my sisters and fellow laborers and sometime blunderers. IRL*I'm there in the photo (really), one of a whole bunch of women at the WOTH Furlough Retreat, unrecognizable from all the rest....anybody and everybody. I'll be looking forward to reading more of your posts here and your articles on WOTH mag! I spotted you! You are hard to miss! What a blessing you will be to so many ladies out there! Dunefuls of love & blessings to you. I am so excited for this new blog and can't wait to connect on things that happen to anybody...but somehow, not everybody! You silliness is an inspiration! Thank you for pouring out your soul so that we can all do the same together! You are a blessing to all of us, J.J.!! I look forward to anything that you will share...it always brings me a smile! I am 52 and have been living overseas off and on since 2001. I can so relate to what you've shared here about your view of yourself as anybody and everybody rather than nobody. I think my trademark if I have one would be my trasparency in ministry. I am so excited to meet a kindred spirit. May God bless the words that dot the pages of your blog over this next year so that they speak directly to the hunger in women's souls. Thanks so much for all the comments and encouragement. I, too, feel that we are kindred spirits here. I'm looking forward to getting to know each of you new friends. Some neighbors sent me a crown cake for "Dia de los Reyes" (Kings' Day) yesterday. I wish you could all come up and have a slice with a cup of tea or hot chocolate. Never mind that it is dry and stale already. The visit would do us all so much GOOD! Hi so glad to see this link on the weekly email from WOTH. I will be glad to read and be encouraged here. Thanks for taking the time to do this. I'm looking forward to sharing in your life adventures. It's a blessing to connect with other women working all around the world! Well, as a reflection of where I'm at, I can't get my husband's gorilla picture off the profile id - enjoy! Thanks for your transparency. I don't know if it's an age thing, a generational thing, or what, but that always speaks so much to me (I'm 45, for what it's worth). I'm looking forward to hearing what you have to share, because it's just so encouraging to know that someone else out there understands this wild life we live. The wild life. Yes, that about sums it up. Maybe the gorilla profile pic is appropriate. We should explore together the "wildness" of this adventure. Makes me think of Narnia. He's no tame Lion, for sure. Wonderful! Thank you! Love to hear the humor and stories...it's SO great to hear I am normal! What a relief! "Anybody and Everybody" - well said! God bless and anoint your new ministry here for us! "Normal is only a setting on the dryer." Funny thing is that most of us don't even have a dryer! No, my friend, I'm afraid there is nothing normal about us. Just be encouraged that you are certainly not alone. I had to giggle again reading your decription bar - especially that you are the author of the unmentionalbes article. I tried to post a reply to that, but alas Africa internet crashed that day. I am sure that we all have stories of that - my unmentionables story was to buy my feminine sanitary supplies for 4.5 years. To top it off, the next week, I was back in the store. This time to purchase supplies for my teammates, heading out at the same time. Their need - diapers for their 1 & 2 year-old. So, I had a warehouse trolley full of diapers. I could only hope that the security guards nor cashier did not recognize me from the week before! I look forward to reading of your journey here. If only we could be in the U.S. long enough to figure out how to use those self-help check-out cash registers!